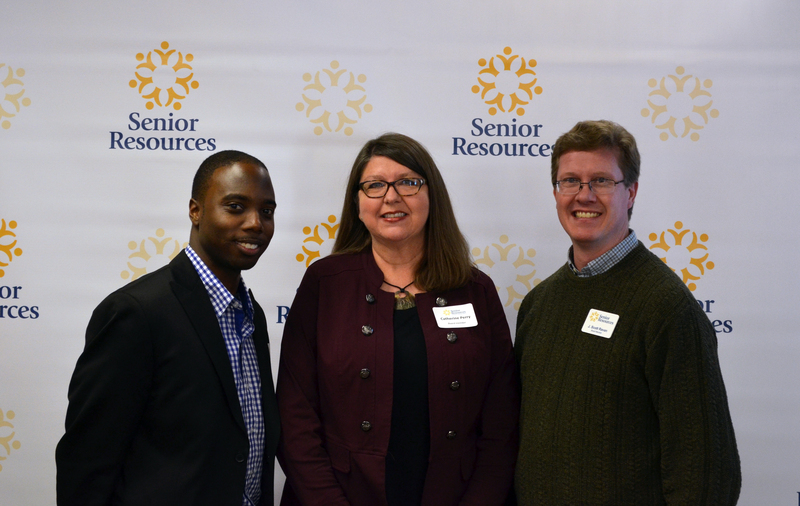 The Board of Directors at Senior Resources held its 51st Annual Meeting on January 25, 2019, to celebrate the accomplishments of the past year, elect new board members and recognize the support of several key community partners. The FY2018 Annual Report was also presented at the meeting, and can be viewed online here. 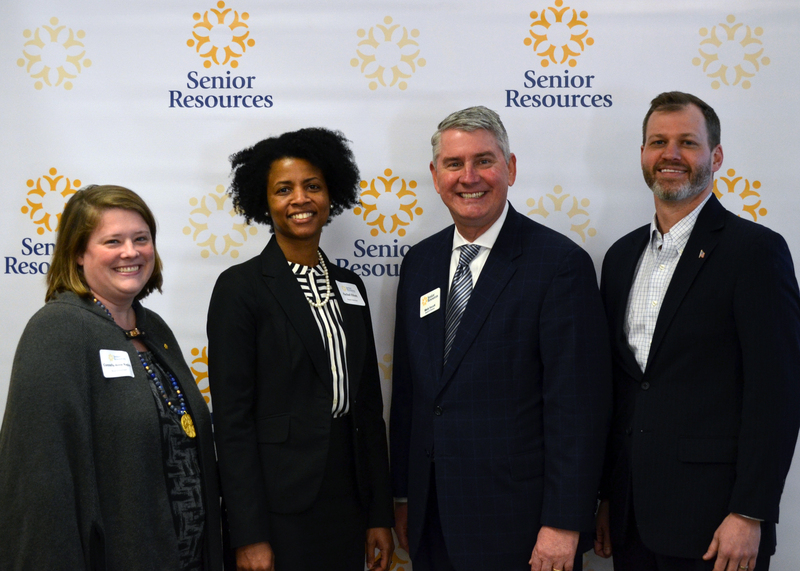 Installed as new board members were Bryant Davis, Assistant Director of Government and Community Services for Richland County; Catherine Perry, a Senior Performance Consultant at BlueCross BlueShield of South Carolina; and J. Scott Ravan, CFO at Columbia Development. Officers of the Board of Directors were also elected. Todd Timmons (far right), an attorney for Shaw Air Force Base, will serve as president. Connelly-Anne Ragley (far left), a government affairs professional for Denny Public Affairs, will serve as vice president. Rachel Elliott (center left), Supervisor of Rates & Regulatory Accounting for SCANA, will serve as treasurer. And Mark Hocutt (center right), Vice President and Business Banking Client Manager for Bank of America, will serve as secretary. The Community Partner Award, given to a corporation, church or organization that has provided major support to Senior Resources through financial donation, sponsorship, or assistance with a major project or needed service, was granted to Spring Valley Presbyterian Church. A year ago at this time, about 50 homebound seniors in the Northeast were receiving a weekly supply of frozen meals from Senior Resources. They lived too far from our meal distribution site downtown for us to maintain a safe, hot temperature to deliver hot meals every day. Spring Valley Presbyterian Church offered to let us establish an additional meal distribution site at the church, allowing us to use their kitchen facilities. Today, those 50 clients now receive a daily hot meal and a visit from a Meals on Wheels volunteer, many of whom were recruited by church members and staff. 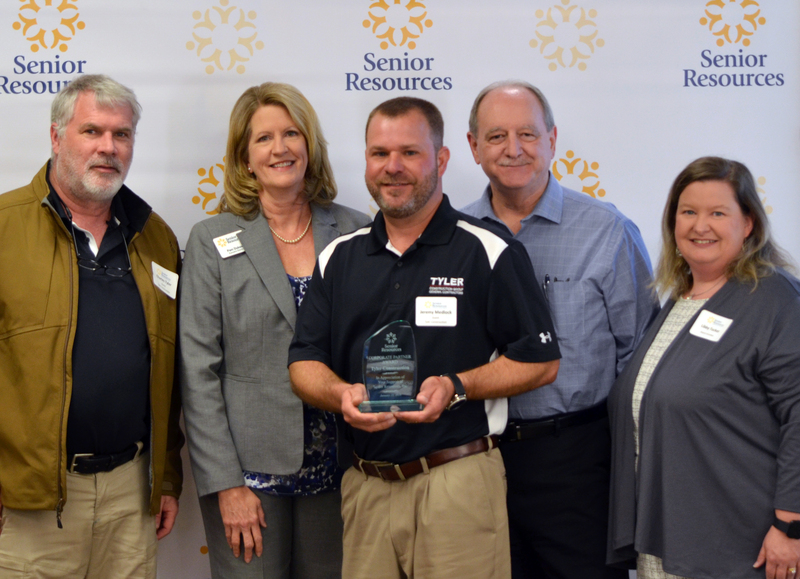 The Corporate Support Award, given for significant support of Senior Resources through financial donation or in-kind service, was given to Tyler Construction, who constructed Senior Resources new Meals on Wheels facility. Because of the age of the building, the project presented some challenges, but Tyler Construction showed a creative approach, and thoughtful adherence to the non-profit budget. After the center opened, Tyler also noticed the building’s front door was crumbling and no longer secure, so they replaced it at no cost with an attractive, secure and weather-tight new doorway. 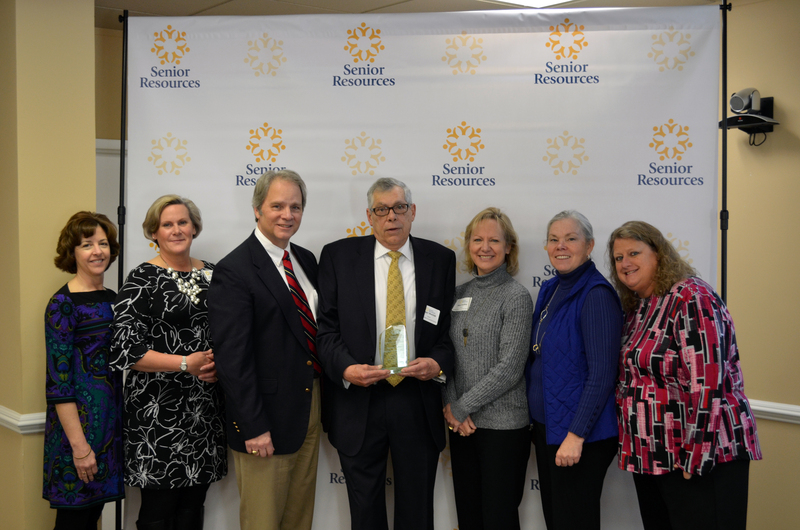 The Leonard L. Price Fundraising Award recognizes an individual or group who has gone above and beyond in their fundraising efforts for Senior Resources’ programs, including using their resources to help raise awareness which has aided in the agency’s fundraising efforts. 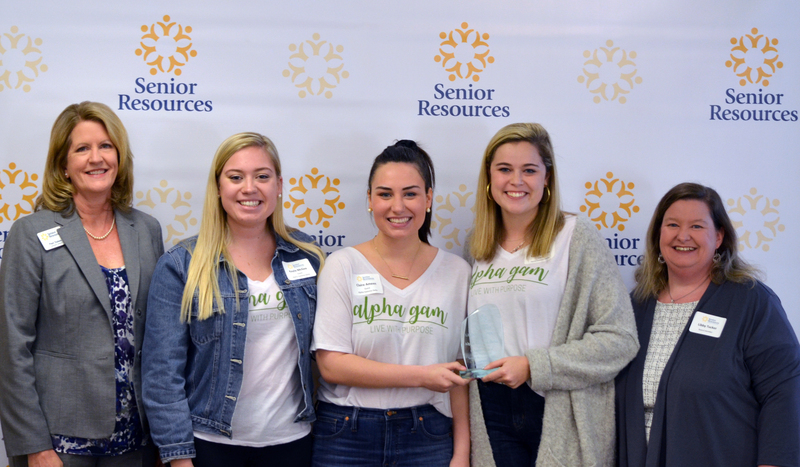 The award was presented to the University of South Carolina chapter of Alpha Gamma Delta. The sorority has focused its philanthropy efforts on hunger relief across its chapters nationwide for the past few years. The chapter at USC has chosen to partner with Meals on Wheels. For the past several years, the members have spent time delivering meals on a weekly basis. They also made Valentine cards for all our clients last year. And in the spring, they held a fundraising event called Poker and Pearls. The event raised $5,000 for our Meals on Wheels program, which is among our largest non-corporate donations of the past year. 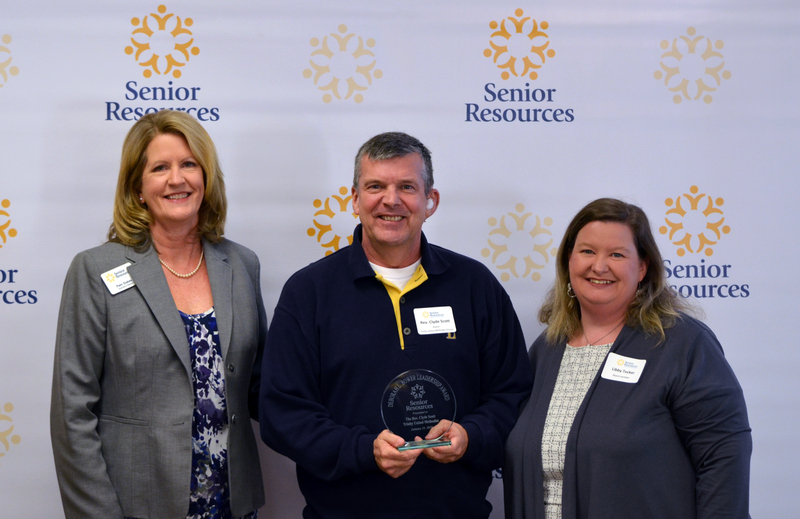 The Season of Service Award is given to a volunteer who has served Senior Resources over time with dedication, enthusiasm, passion and distinction. This year’s award was given to Jackie Cominotti. She single-handedly has run our Pet Pals program for more than 10 years. This program provides a monthly delivery of pet food to any Meals on Wheels client who has a cat or dog, or in some cases, a bird. We know that pets are an important source of comfort and companionship to many home-bound seniors, so our Pet Pals program helps them take care of their pets without a financial burden. The program has grown from about 5 pets to over 85 pets in the past four years with Jackie’s help. The Billy Webster Award is given to a person who exemplifies the spirit of giving. 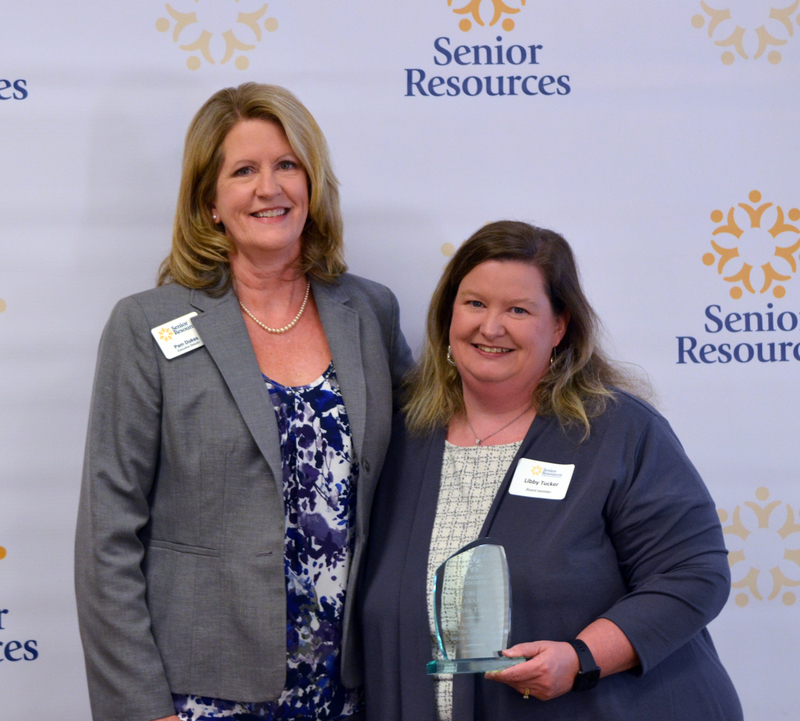 This year, the award was given to Libby Tucker as she completed her term as the president of Senior Resources’ board of directors. Libby began her involvement at Senior Resources as a Meals on Wheels volunteer more than 15 years ago. The time spent delivering meals to home-bound seniors inspired a passion for our mission, and seven years ago, she joined our board of directors. Since then, she has worked tirelessly to advocate for our seniors, promote our programs, and support our fundraising efforts. For the past two years, she has served as our board president, yet still takes the time on a regular basis to deliver a Meals on Wheels route and spend time with the seniors we serve. The Deborah Bower Leadership Award was created in 2013 to recognize outstanding leadership service provided by an individual in support of our mission. Debbie Bower was the Executive Director of Senior Resources until her death in 2012. This year’s award was granted to the Rev. Clyde Scott, pastor at Trinity United Methodist Church in Blythewood. He led the church to open its doors to the Senior Resources’ Wellness Center clients in Blythewood. The church’s Hillclimbers senior group has invited these seniors to join them for their lunch program every month, at no cost to our clients. And for two years, the church has hosted a holiday lunch for all of Senior Resources’ Blythewood clients, including a meal, live music and fellowship time with their neighbors and peers. In addition, for Christmas, church members adopted every senior at the Wellness Center, and every senior receiving Meals on Wheels from the Blythewood Center, and presented each with a bag of gifts for the holidays.